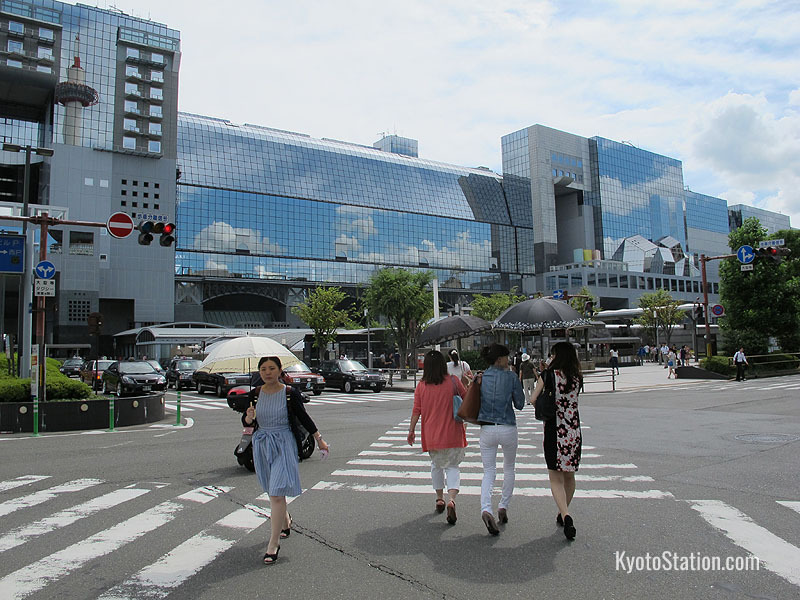 Kyoto Station is a major transportation hub in western Japan, and it is housed in one of Japan’s biggest buildings. 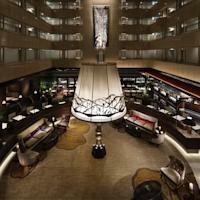 Besides the station itself there are numerous shops, restaurants and other facilities in the Kyoto Station Building. This article will familiarize you with the general layout of the station itself and its train lines, so that when it is time for you to catch your train, you can do so calmly, quickly and with ease. 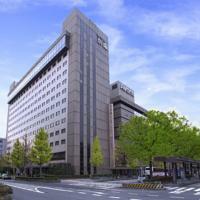 Kyoto Station can be entered from the north or the south. The north side of the station is called the Karasuma side. 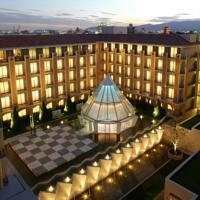 This side faces onto Kyoto Bus Station and Kyoto Tower. 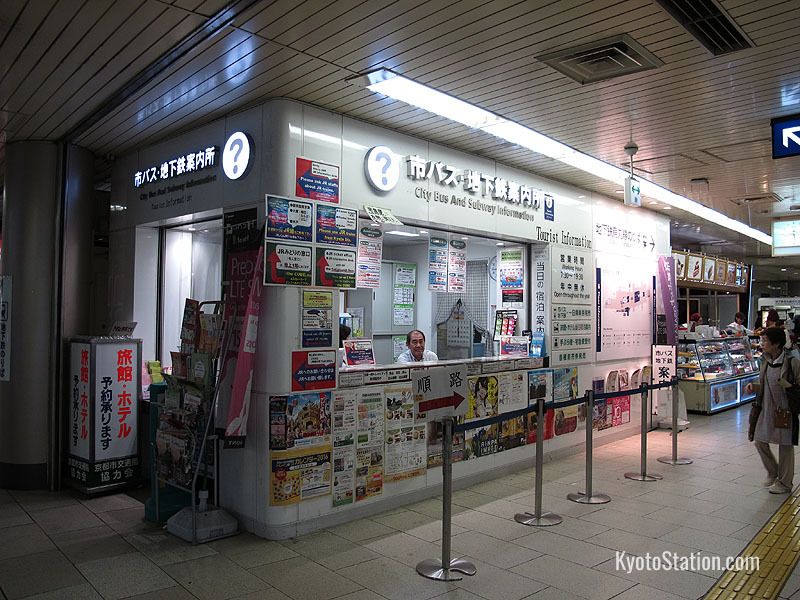 You will find the main Central Gate (also called the Chuo Gate) for the JR train lines here. The south side of the station is called the Hachijo side because it faces onto Hachijo Street. This side of the station faces onto shopping malls and hotels. 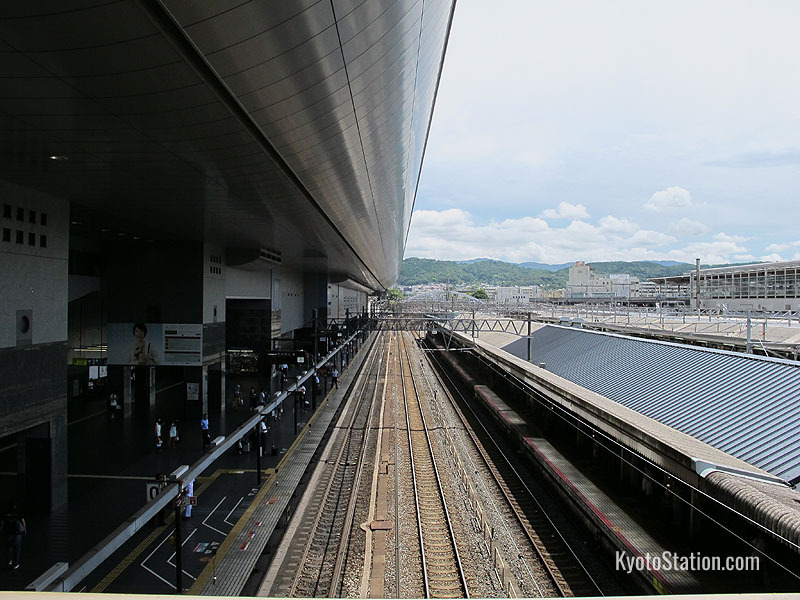 In the Hachijo side of the station building you will find the Shinkansen platforms and Kintetsu Kyoto Station. There are two main routes connecting the north and south of the station building. 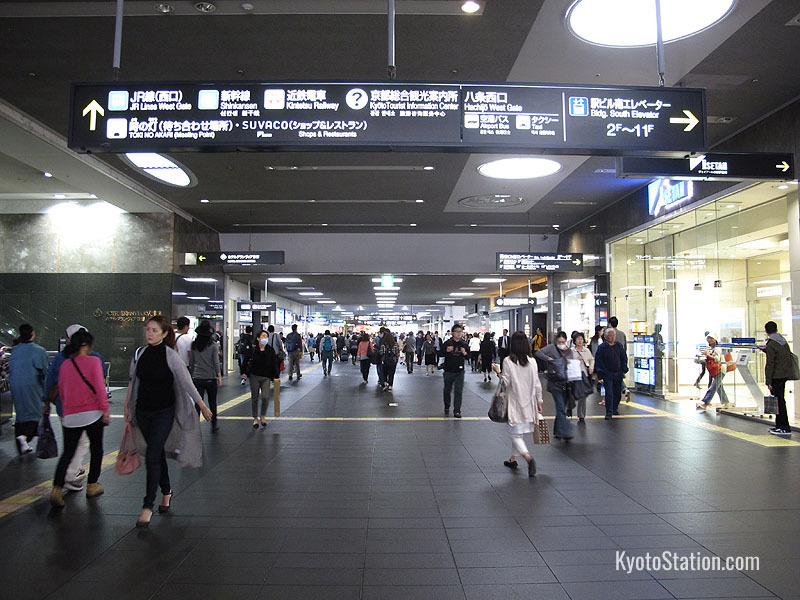 On the second floor, to the west of the Central Gate, there is a pedestrian walkway that runs north – south past the Isetan department store, and then past the West Gate for the JR Lines, as far the Shinkansen tracks and Kintetsu Kyoto Station. On the east side of the station building there is also an underground passage that connects the two sides of the station. Walking from the south back to the north, this passage connects the Shinkansen tracks, the JR Lines and Kyoto Subway Station, before continuing on into Porta underground shopping complex. Looked at on the map, the Pedestrian Walkway on the second floor seems to cut the station in two. 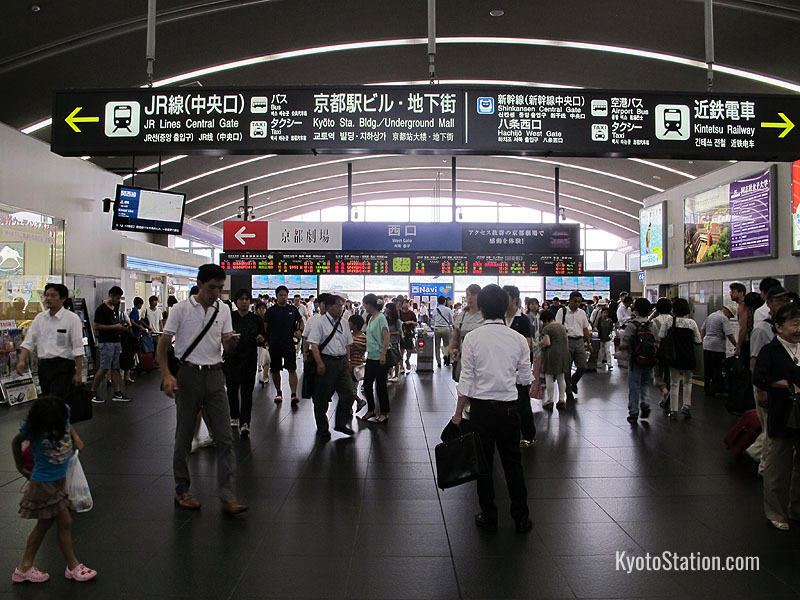 On the west side of the walkway you can find JR platforms 30 – 33, and Kintetsu Kyoto Station. On the east side of the walkway you can find JR platform 0 and the Shinkansen platforms. JR platforms 2 – 10 straddle both sides of the walkway. You might notice that there is no platform 1, which might seem strange but that track is used for freight only and so doesn’t need a platform. Running north to south here are JR platforms 0 – 10 with the main train lines they serve, and their key destinations. Click on the links to learn more about each line. Platform 0: Boarding for the Thunderbird Limited Express on the Hokuriku Line for Fukui, Kanazawa & Toyama. Also boarding for the Shinano Limited Express on the Tokaido / Chuo Lines for Nagano. Platforms 2 and 3: Boarding for the JR Biwako Line for Otsu, Omi Hachiman, Hikone & the Hokuriku Region. Also boarding for the JR Kosei Line for Hieizan Sakamoto, Ogoto Onsen & Omi Maiko. Platforms 4 and 5: Boarding for the JR Kyoto Line for Osaka, Sannomiya & Himeji. Platforms 6 and 7: Boarding for the Super Hakuto Limited Express on the Chizukyuko Line for Tottori & Kurayoshi. Also boarding for the Kuroshio Limited Express on the JR Kinokuni Line for Wakayama, Shirahama & Shingu. Platforms 8, 9 and 10: Boarding for the JR Nara Line for Tofukuji, Inari, Uji & Nara. Platforms 30 – 33 are located in the north-west corner of the station. Platform 30: Boarding for the Limited Express Haruka for Kansai Airport. Platforms 31, 32 and 33: Boarding for the JR Sagano Line for Nijo, Uzumasa, Saga-Arashiyama. 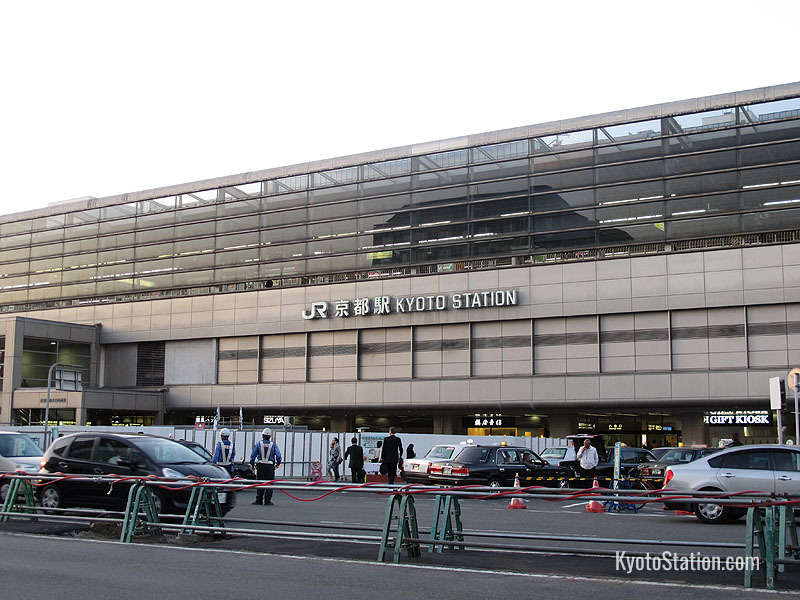 The Shinkansen platforms are located in the south east side of Kyoto Station. Here you can board high speed “bullet trains” on the Tokaido Shinkansen rail line which runs between Tokyo and Shin-Osaka. Platforms 11 and 12: Boarding for trains bound for Nagoya and Tokyo. Platforms 13 and 14: Boarding for trains bound for Shin-Osaka and Hakata. All entry points for the Shinkansen platforms are on the south side of the station. The Shinkansen Central Gate, the Shinkansen Hachijo Gate, and the Shinkansen Hachijo East Gate give you direct access to the shinkansen tracks. 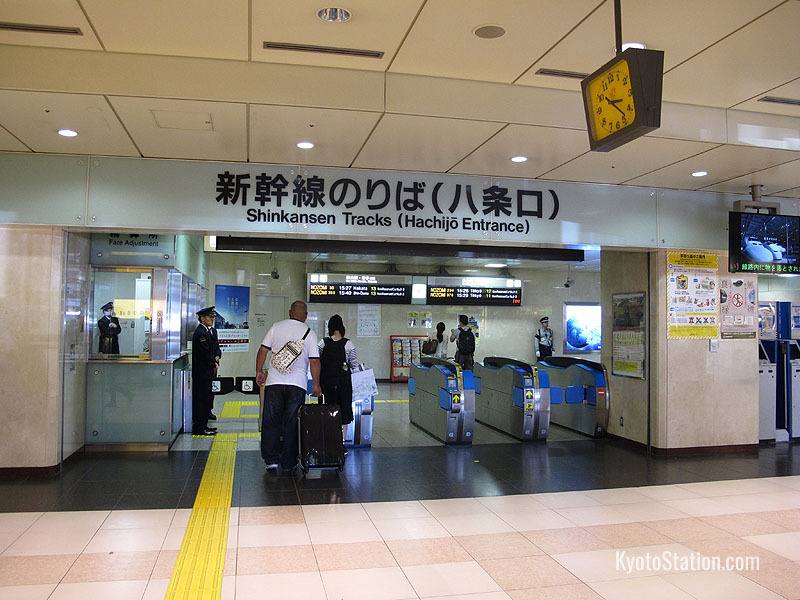 It is also possible to transfer from the regular JR West platforms via transfer gates: the Shinkansen East Transfer Gate and the Shinkansen Central Transfer Gate. For a more detailed explanation of the Shinkansen services at Kyoto Station, please read our article: The Tokaido Shinkansen. 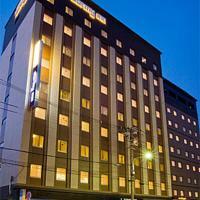 Kintetsu Kyoto Station is located on the second floor of the south west corner of the Kyoto Station building. This is run by Kintetsu Corporation which is a private corporation and completely separate from the JR West rail services in the rest of Kyoto Station. Kintetsu Railways are useful if you want to travel from Kyoto to Nara and Yoshino in Nara Prefecture, or Ise, Toba and Kashikojima in Mie Prefecture. 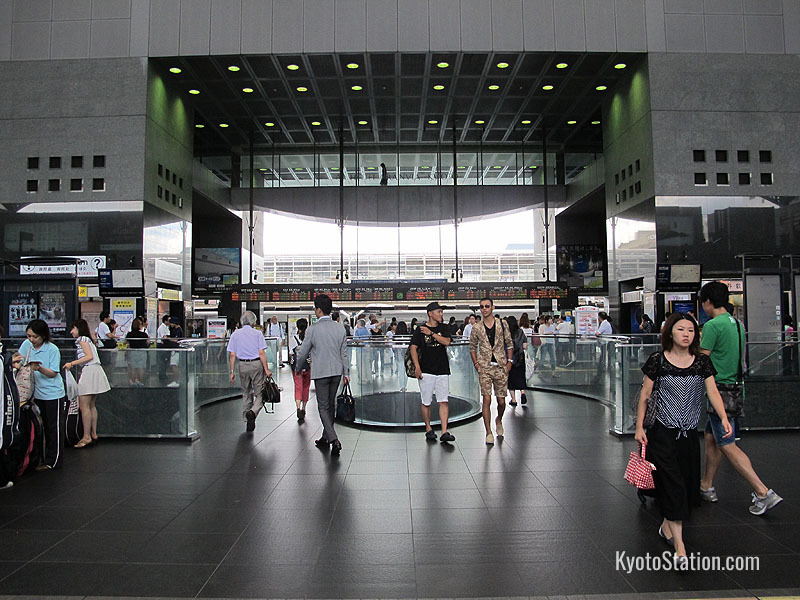 There are four platforms in the Kintetsu Kyoto Station. Limited Express trains depart from platforms 1 and 2. Local trains and Express trains depart from all platforms. 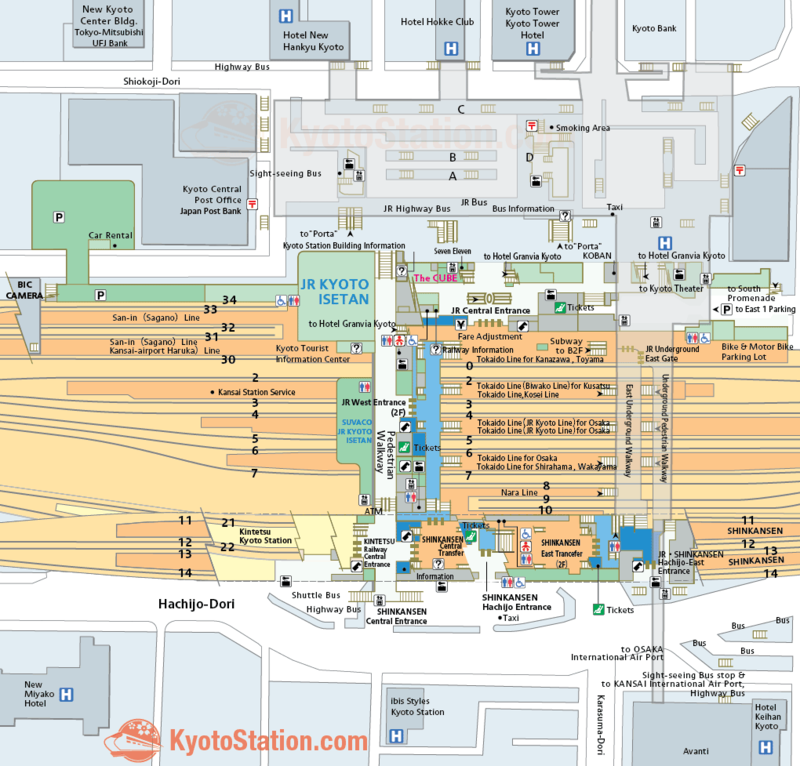 You can download a map of Kintetsu Kyoto Station at the official Kintetsu Corporation website. 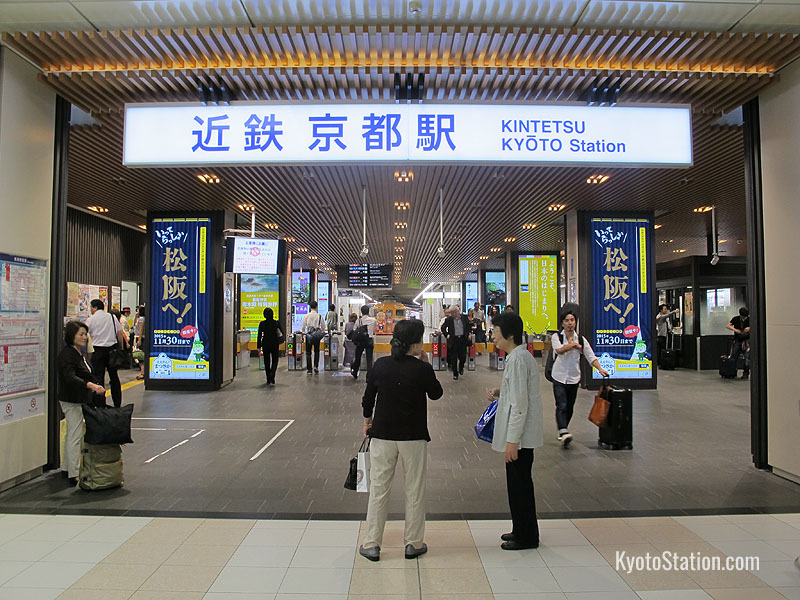 Read our article Kintetsu Kyoto Station for a more detailed account of this railway’s services. 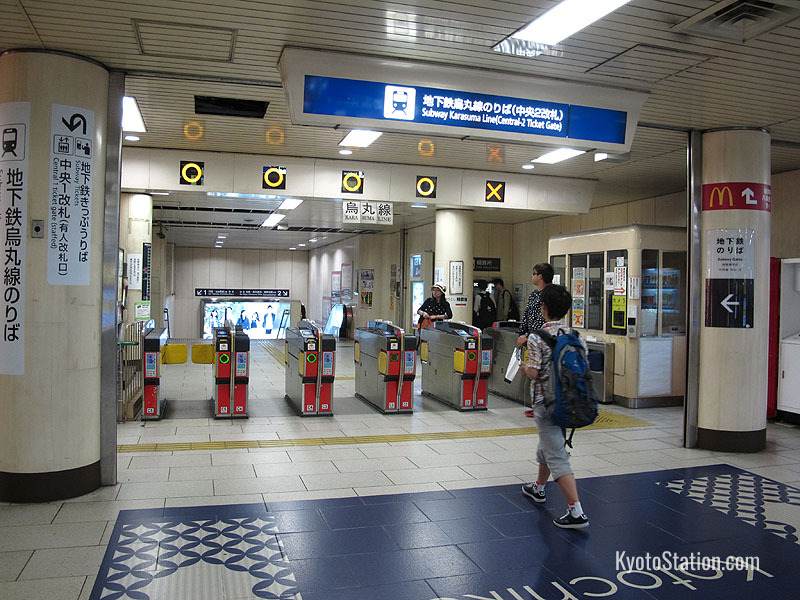 Kyoto Subway Station serves the Karasuma Subway Line which runs north to south through Kyoto city. This line is very useful for getting from Kyoto Station into the center of the city. It is one of only two subway lines in Kyoto, and it connects with the other subway line, the Tozai Line, at Karasuma Oike Station. The Tozai Line runs east to west through the city, and between them these two lines give you access to many important sightseeing locations. 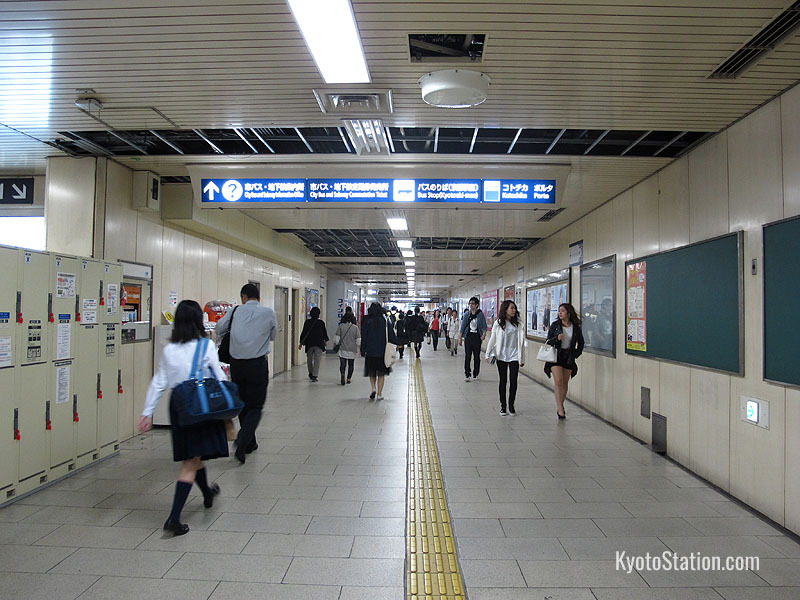 To read more about the subway system in Kyoto, read our articles: Karasuma Subway Line and Tozai Subway Line. 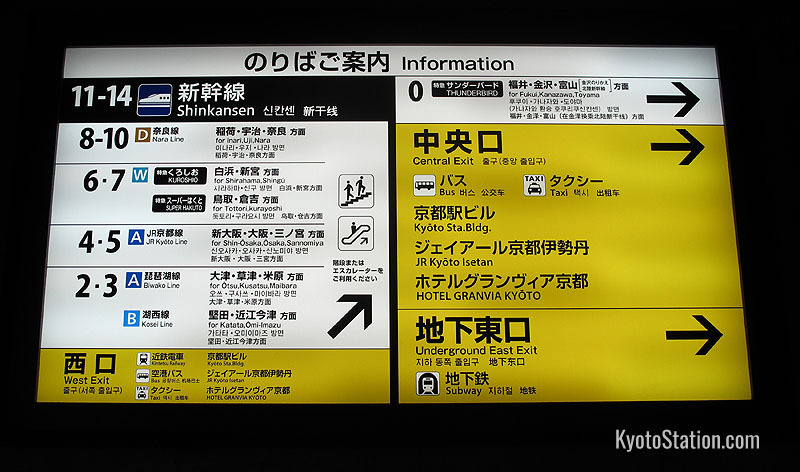 Entry points for Kyoto Subway Station are scattered throughout Kyoto Station Building. 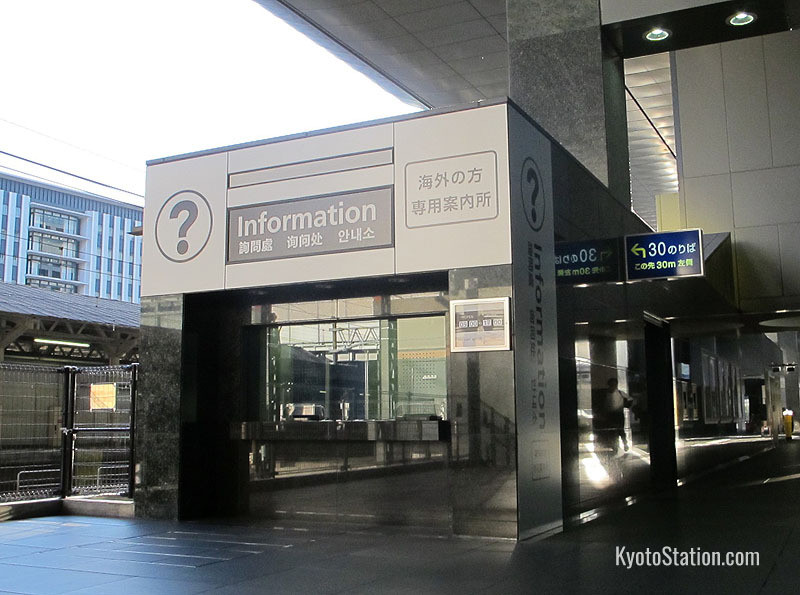 The easiest access point to find inside Kyoto Station is the underground passage on the east side of the station building. Outside Kyoto Station, on the northern Karasuma side, you can also find many clearly marked gates for the Porta underground shopping mall. 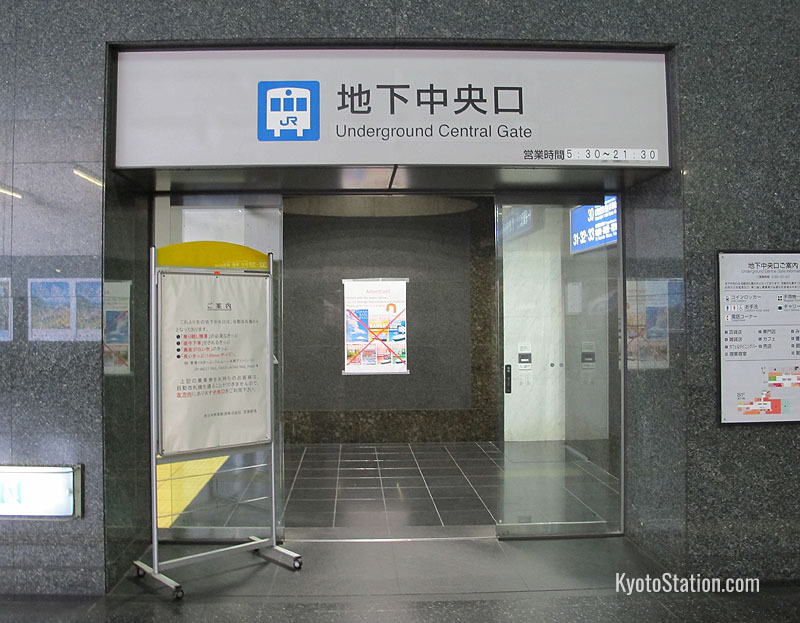 You can also use these to access Kyoto Subway Station.